Making the argument that a video game contains some surreal elements may seem like a no-brainer. After all, the majority of video games take place in worlds that look nothing like our own and give players abilities that have little connection to the “real.” But when it comes to the Super Mario Bros. franchise, surreal elements are pretty much all you’ve got. You play as an Italian plumber who punches bricks for coins, stomps on angry walking mushrooms, and occasionally dons a tanuki suit, all while trying to rescue a princess from a giant, fire-breathing turtle monster. It’s enough to make Dalí’s mustache curl. In the latest video from the PBS Idea Channel, host Mike Rugnetta makes the case that Mario games not only contain aesthetic similarities to surrealism, but that the franchise may actually be the spiritual successor to the surrealist movement’s philosophy as a whole. As described in André Breton’s 1924 Surrealist Manifesto, the surrealist movement was a reaction to the rise of fascism in Europe at the time. The uncomfortable, dreamlike qualities of surrealism were intended to break people out of the complacency of modernity and get them in touch with their pre-rational brains. 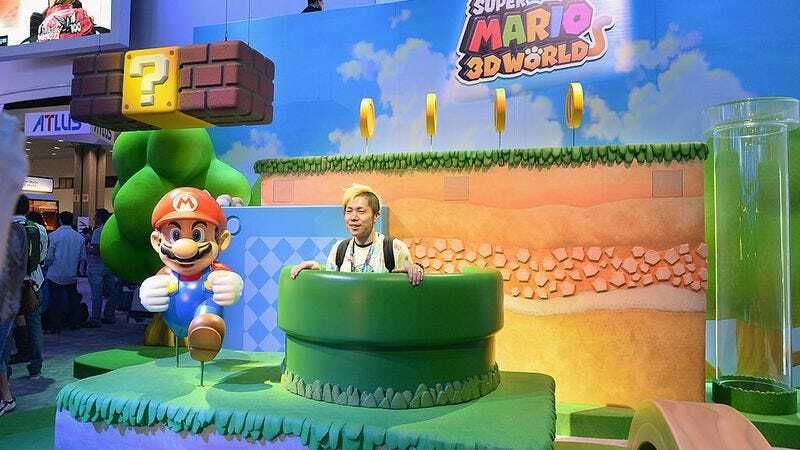 While some of these bizarre, dreamlike elements are commonplace in Mario games, it’s difficult to argue that Mario creator Shigeru Miyamoto was thinking about fascism and pre-rational brains in the early days of Nintendo. Instead, Rugnetta argues that the Mario franchise was born straight out of postwar Japan’s densely packed media landscape. Following WWII, Japan abandoned its traditionalist roots and rebuilt itself as a postmodern nation, skipping the familiar comforts of modernism experienced by other countries at that time. Thus the frenetic, overpopulated commercial culture that seems so surreal to Westerners is actually quite normal in Japan since they’ve never had it any other way. So, is Mario a surrealist or not? Well, sort of. Rugnetta concludes that, while their origins may be quite different, the surrealist movement and postmodern Japanese culture have one thing in common: They’re both looking forward. Surrealists like Breton wanted to wake people up from fascism and break free from the restraints of their past. Current Japanese culture has successfully broken those restraints and embraces the new and strange with open arms. Mario may be dismantling fascism brick by brick, but that’s just something that happens naturally when you’re continuously moving forward through the stage.